Cheer on the World’s most famous invitational rugby side when you wear this Barbarians 2019 Players Rugby Bobble Hat from Gilbert. With our winters getting colder and colder and weather reaching extremes you'll need to stay dry, warm and protected from the elements in this comfortable bobble hat. The lightweight fabric provides superior warmth and comfort whilst the material wicks sweat away from the wearer whilst drying really fast. Made from acrylic knit one size should fit all. This hat is classic Barbarians colours in black and white. The hat is predominantly black with white stripes running around the circumference. The team badge is embroidered onto the front of the hat on the fold up. 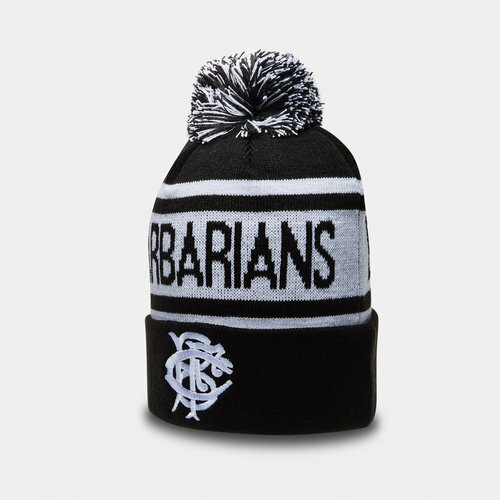 The word Barbarians has been sublimated into the design of the hat which has been finished off with a bobble.